a great pattern to revise and have it be a pattern all on it's own. The only thing I really changed from the original pattern is now it is all one piece aside from the handle. 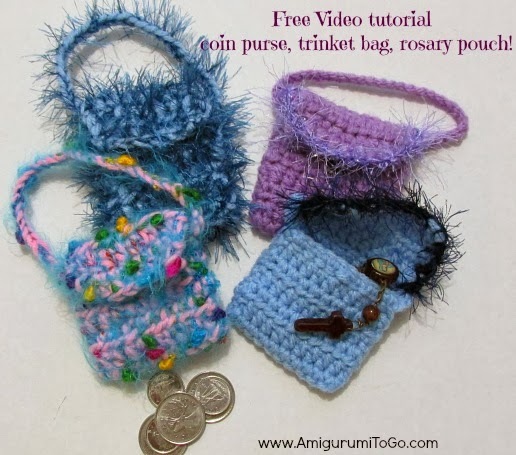 And also that it can be used as a coin purse, trinket bag or Rosary pouch. 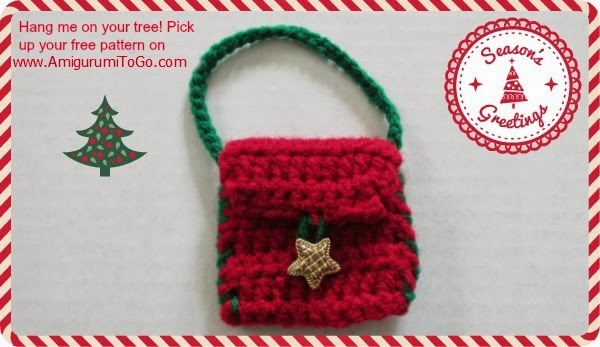 Use as party favors or hang on the Christmas tree with a little gift inside. The possibilities are endless and so is the fun! This is a great project for using up left over yarn and can be completed in under 30 minutes. Special notes: I worked with a 3.75mm hook and worsted weight yarn and I also worked this pattern holding worsted weight yarn and a specialty yarn together. Have any questions or if you come across a mistake in the pattern please leave a message in the comment section below. 1) ch50 f/o and leave a long enough tail to sew the handle in on both sides. place chain along the inside edge of bag as pictured and whip stitch the 2 edges of the bag together and at the same time you will be sewing the handle in place. Start at the bottom edge of the bag and work your way up towards the top of the bag. You can weave the yarn tail across the front of the purse then whip stitch the other side just as you did for the first part. Knot off when done and weave the yarn tail in. Happy Holidays and All the best to you in 2014!! What a great way to use up left over yarn. Thanks for the pattern. I wonder if it is possible for me to translate some of your patterns into Spanish and share with my blog readers? There are many spanish crocheters that can not read English descriptions. Obviously, I will link to you and your pattern and give you credit for the work! Wow, what a beautiful blog and yes, absolutely I would love for you to translate some for the Spanish readers. I will also share your blog with my facebook page members.. I know many will really be happy to find you. Thanks so much and I look forward to seeing more of your work! I was wondering what the finished size is?